^ Hans-Jürgen Goertz. 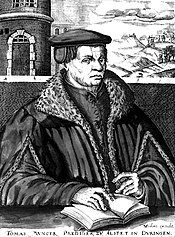 Thomas Müntzer: Apocalyptic Mystic and Revolutionary. ISBN 978-0-567-09606-7. ^ 麥格夫著，陳佐人譯. 《宗教改革運動思潮》. 香港: 基道出版社. 1991年12月: 9–10页. ^ Gilbert, William, CHAPTER 15 THE RADICALS OF THE REFORMATION, THE ANABAPTISTS AND THE REFORMATION . ^ 5.0 5.1 博饒本著（Edmund Hamer Broadbent），梁素雅、王國顯譯. 《走天路的教會》（The Pilgrim Church）. 台灣: 晨星出版社. 1931. ^ Vedder, Henry Clay. Balthasar Hübmaier, the Leader of the Anabaptists. New York: GP Putnam's Sons. 1905. ^ 祁伯爾著，李林靜芝譯. 《歷史的軌跡--二千年教會史》. 台北: 校園出版社. 1986年6月: 246–253页. ^ 約翰·甘乃迪著，劉志雄編譯. 《見證的火炬--二千年教會的屬靈歷史》. 提比哩亞出版社. 1997年1月: 190–191页. ^ 布魯斯。雪萊著，劉平譯. 《基督教會史》. 北京大學出版社. 2004年11月: 282–285页. van Braght, Thieleman J, Martyrs Mirror, Scottdale, PA: Herald Press, 1950 , ISBN 978-0-8361-1390-7 . Dyck, Cornelius J, An Introduction to Mennonite History, Scottdale, PA: Herald Press, 1967, ISBN 0-8361-1955-X . Estep, William R, The Anabaptist Story, Grand Rapids, MI: William B Eerdmans, 1963, ISBN 0-8028-1594-4 . Klaassen, Walter, Anabaptism: Neither Catholic Nor Protestant, Waterloo, ON: Conrad Press, 1973 . Marpeck, Pilgram, Klassen, William; Klassen, Walter, 编, Covenant and Community: The Life, Writings, and Hermeneutics, Scottdale, PA: Herald, 1978 . Packull, Werner O, Hutterite Beginnings: Communitarian Experiments During the Reformation, Baltimore, Maryland: The Johns Hopkins University Press, 1995, ISBN 0-8018-6256-6 . Stayer, James M, The German Peasants’ War and Anabaptist Community of Goods, Montréal: McGill-Queen’s Press, MQUP, 1994 , ISBN 0-7735-0842-2 . Williams, George Hunston, The Radical Reformation 3rd, Truman State University Press, 2000 , ISBN 0-664-20372-8 .